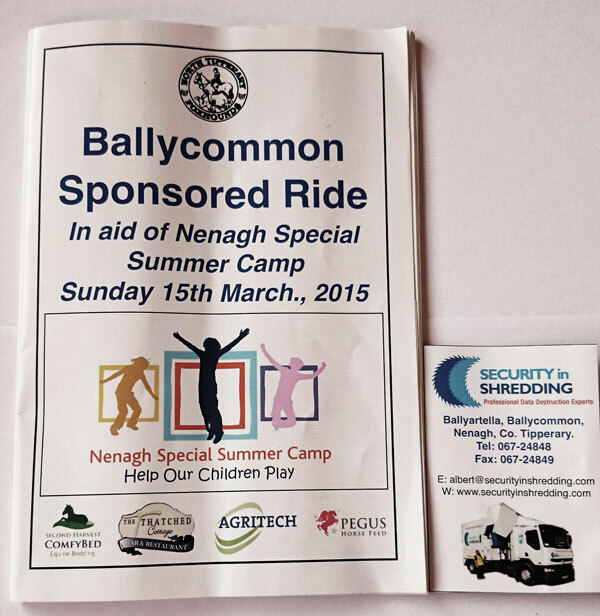 Security in Shredding sponsors Ballycommon Sponsored Ride 2015 in aid of Nenagh Special Summer Camp. Away from Data Protection and Secure Data Destruction (Paper Shredding, Media Shredding and Secure WEEE Recycling); Ballycommon Sponsored Ride 2015 approached us, Security in Shredding with regard to sponsoring an advert and a cross country jump in aid of Nenagh Special Summer Camp. Not only did the Company donate to the great cause but the brave staff also raised funds and took part themselves and their horses in the event for the day. See photo below. 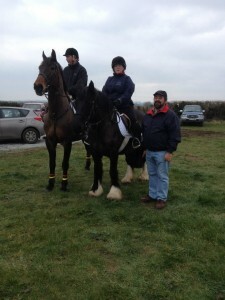 The Ballycommon Sponsored Ride 2015 was very well organised and well done to all involved. Security in Shredding are delighted to have the opportunity to contribute to this very worthy cause – Nenagh Special Summer Camp. This entry was posted in Corporate Social Responsibility, Data Destruction, Data Protection, Data Protection Day, Digital Data, Off Site Shredding, Onsite Shredding, Paper Shredding, Uncategorized and tagged Ballycommon Sponsored Ride, Fund Raising Event by Security in Shredding. Bookmark the permalink.